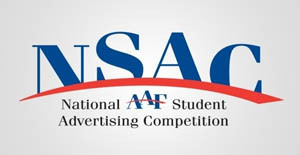 A team of Newhouse School advertising students took second place in the American Advertising Federation (AAF)’s National Student Advertising Competition, held June 5-8 in Phoenix, Ariz. The team, presenting an integrated advertising campaign for Glidden Paint/Walmart, won second place at the AAF District 2 competition on April 27, and advanced to the national competition after the Wildcard round in May. From the strategy team: Allie Guggenheimer (presenter), Lauren Silverman (presenter), Robert Bloomberg (presenter) and Greg Yellin. From the media team: Chris Borncamp, Aileen Coughlin, Jessica David and Lucie Kittel. From the creative team: Megan Miller (presenter), Stefan Hanley (presenter), Rodney Fleming, Jacob Kwasiborski, Phim Her, Christina Nadal, Scott Barrows, Kat Smith, Jillian Young, Julia Matthews and Leigh Ortman. The team adviser was associate professor of advertising Ed Russell, with assistance from professor of practice Kevin O’Neill, department chair James Tsao and associate professor and associate dean Amy Falkner.